has been singing and playing since the age of twelve. He is a self taught musician. He picked up playing the drums by watching the drummer in his Fathers’ band. Not only is John the timekeeper of the band, but he yodels and plays the cowbells as well. John has been playing Semi-Professionally in Chicago, Florida & around the Country for over 40 years. We are always looking for ways to make our band better! 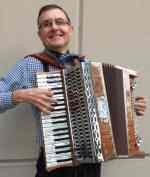 Ken started accordion lessons at age 7, and soon began competing and winning awards at the state and national level. His professional career began at age 16 and one of the highlights was a solo performance at Chicago’s Symphony Center. Ken received a degree in music from DePaul University and a Master of Music Degree from Vandercook College . After retiring from his career as a middle school band director, Ken began performing on Alpine Musette accordion and vocals at several German venues in the Chicago area. Ken is thrilled to be a part of the Euro Express Band! Marty teams up with John for the second time in their musical careers. Marty has been playing the guitar since the age of 5. His guitar playing is like no other. Marty is always striving to make his guitar playing better. He has worked with various German and American Groups such as Stone Witness, Alpine Combo & The Bavarian Boys. Marty is currently working with an American group called Wanderlust, and we welcome Marty into the Euro Express Band.